In the overview you can see a few carat balances from our assortment. With these carat balances you can weigh for example gold or jewels in gram or carat. You can buy them with or without calibration. The RS232 cut and the optional software make it possible to assign the results of the weighing to your computer (except the HC-series). The computer evaluates the weighing. If you want to sell the gold or the jewels you must have carat balances which are calibrated. If you buy carat balances which are calibration-capable, we save your time and spare you the way to the gauging office. 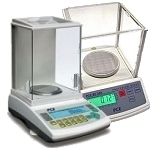 You mention your site and we take the carat balances with a calibration certificate. This applies to sites out of Germany. If you can't find the paper scale you are looking for, please contact us and we will help you find the best solution which suits your needs: UK customers +44(0) 23 809 870 30 / US customers (561) 320-9162 Our technical staff will advise you regarding our products. Our engineers and technicians will be happy to help you with the carat balances, and of course, with the other products in the field of regulation and control, and measuring instruments. Technical specifications of our Carat Balances can be found at the following links. Why do you need carat balances? Do you know how to assess gold or jewels? Carat describes the proportion between gold and another material in one rock together. 1 carat is 1/24 gold in the metal and 23/24 are other substances in that piece of rock. 24 carat is the maximum, but that is impossible. Usually 24 carat are 99,9% percent gold in that rock. All carat balances are verifiable (DKD- just at the site of the deployment- and DIN ISO). Carat balances have to be calibrated every year by the office, but the first time of calibrating of the product applies 2 years. If you want more information about the gauging of Carat Balances or do not know if you need gauged carat balances you can message the country-specific office for gauging. The gauging of the carat balances (carat balances which can be gauged) can be conducted at the first initial order or at recurring gauging. After a gauging by the office of gauging you are not allowed to calibrate the other carat balances. The first time of gauging is valid for 2 years. Then the carat balances have to be gauged every year. You are currently at: Home/measuring instruments and test equipment/scales and balances/Carat Balances.